As probably the last Nvidia performance board we'll ever see: this AM3, DDR3 nForce 750 chipset G55 from MSI is one of the few SLI capable motherboards for AMD out there. How does it stack up against other budget AMD chipsets? We found out. Asus takes Nvidia's nForce 780a to the next level with its second generation CrossHair motherboard. Does Hybrid Graphics cut the mustard? Does Asus make another Republic of Gamer masterpiece? We went off to find out. Nvidia has denied rumours started by Digitimes that it is to quit the motherboard chipset market in favour of concentrating on its graphics card technologies. EVGA has gone For The Win with a board that's been upgraded from the nForce 750i SLI reference design. We put it through its paces to see if there really is the Cheesecake at the end of the tunnel. We look at XFX's Nvidia nForce 790i Ultra SLI motherboard to find out if it offers that much more than Intel's X48 or even its own nForce 780i SLI. Do higher prices automatically get you more performance? The answers are inside. During our trip to China and Taiwan earlier this month, we paid a visit to MSI's headquarters in Taipei to see what the company is up to. 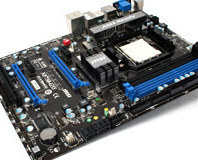 Today, we've got pictures and thoughts on two of the company's newest motherboards - the P45 Platinum and K9N2 Diamond. Nvidia has launched its ultra powerful, ultra expensive "enthusiast" DDR3 chipset - nForce 790i Ultra SLI is here! We dive into the technology behind it in this first look to see what all the fuss is about. The original Striker was arguably the most popular motherboard in the Asus RoG series and now it gets a brother - the Striker II. It's based on the new Nvidia nForce 780i SLI chipset and has many tweaked features - we check it out to see what's changed. After spending most of Friday afternoon talking with several Nvidia representatives about its Hybrid SLI technology, we're back again today to add some more insight into it. We've got more information on display support, the mGPU and some future considerations. On the morning of CES, Nvidia announced its Hybrid SLI technology. Rather than rushing out a quick article, we decided to spend time doing some real analysis of what was discussed. Read on to find out how this exciting technology is shaping up. EVGA nForce 780i SLI FTW err... cheesecake? CES 2008: EVGA showed us its latest slice of cheesecake at its CES suite - the EVGA nForce 780i SLI FTW motherboard. We've already taken a first look at the nForce 780i SLI reference design, but how does it perform? Does PCI-Express 2.0 add much and is it an improvement over the nForce 680i SLI? We test single card and SLI to find out. We know some of you have been waiting quite a while for an update to the massively popular nForce 680i SLI chipset - and now it's here: the Nvidia nForce 780i SLI. We pull 780i apart to let you know what that extra hundred gets you. HP Blackbird 002 - CrossFire on nForce! According to an interview with Rahul Sood on CustomPC, the new HP Blackbird 002 runs both CrossFire and SLI on an Nvidia 680i SLI chipset. The latest P30 BIOS for Nvidia's nForce 680i SLI chipset claims to offer a whole host of performance and overclocking improvements, so does it give a new lease of life to an ageing chipset? XFX is another Nvidia graphics board partner that has joined the motherboard market with an enthusiast-orientated nForce 680i SLI motherboard. We check it out to see if it's worth buying instead of the Inno3D and EVGA boards already on the market. Gaming on a budget? Cheap motherboards worth the bother? Well the new nForce 650i Ultra chipset seems to fit the inexpensive bill quite nicely, and not everyone needs SLI! We test EVGA's board to see if it's really worth spending a few monies instead of a lot. Have you seen the issues with some of the latest hardware releases? Brett Thomas takes a look at the industry's recent "batteries not included" stance, and wonders...do we all have ADD or something?